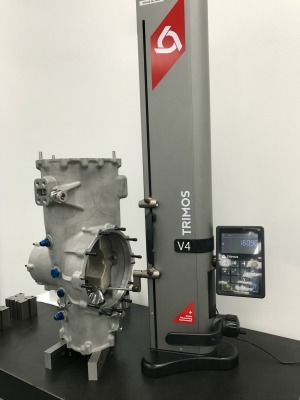 British gearbox specialist Xtrac has invested in multiple Trimos VL300 Height Gauges to ensure the accuracy of components used in high performance transmission systems and driveline components for the Motorsport industry. Based in Thatcham, Berkshire, Xtrac provides complete package services involving the design, manufacture and build of gearboxes or individual components, supporting a wide client base covering top level professional Motorsport and high performance Automotive. Due to the diverse range of high quality, precision components designed and manufactured by Xtrac, accurate and repeatable measurement is imperative to delivering high specification parts. Xtrac’s structured capital expenditure plan ensures that the customer's expectation is matched by Xtrac's measurement capability and in doing so enables the company to continually face the challenge of producing the highest precision parts possible. 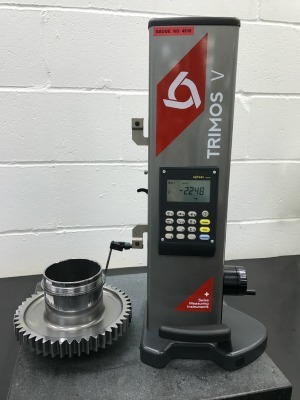 To satisfy the highest levels of accuracy and repeatability, Xtrac was in need of an easy to use, multi-functional, accurate height gauge for use on both the shop floor and in the quality inspection department. In order to satisfy the ever-increasing expectations of its customers, Xtrac meets the highest levels of quality in line with ISO 9001:2008 certification across the whole business. Gear cutting and manufacturing is extremely specialist, requiring accuracy to within a few microns; therefore Xtrac must utilise a full range of testing equipment and electronic instrumentation to consistently meet tight tolerances. From receiving raw materials to supplying finished assemblies and components, every step of the process is recorded, offering Xtrac’s customers the confidence of knowing that they are receiving consistent and repeatable quality. Trimos VL300 Height Gauges are robust, highly accurate height gauges ideal for achieving high precision results. Perfect for use in even the most difficult workshop environments, the Trimos height gauges include simple display units that provide directly accessible functions, depicted with symbols that are easy to understand. This allows for easy and quick handling even by unqualified personnel. The height gauges are used for everything that requires an accurate height/length measurement. This includes a variety of high precision components including small parts such as washers, right up to full casting gearbox main cases, and everything in between. Xtrac’s inspection equipment also includes a selection of bore micrometres from Bowers Group which are used at length in both the grinding and milling departments for the accurate measurement of shafts. XTRAC Inspection Manager Neil Warwick said: “The service we receive from Bowers Group is brilliant. They are very reliable height gauges, but when they do need a full service, the technicians really know their stuff. We always get them back within a week to 10 days when they’re sent off for repairs or maintenance. The support and back up we receive from Bowers is exceptional. Xtrac is a 100% employee owned company, meaning everyone employed is a shareholder. Its dedication to continuous improvement, supported by personal development plans for staff, result in excellent staff retention and a highly incentivised working environment. Xtrac has been in business for 33 years, now working from the 8,200m2 purpose-built factory in Thatcham, Berkshire. Machinists work around the clock with Xtrac’s own unique materials, machining complex components directly from CAD data. Solutions are delivered customers throughout the world; not only to the motorsport industry, but also to the company’s growing automotive and engineering customers. With virtually all of the world’s top Motorsport teams relying on Xtrac’s specialist expertise, 90% of the components designed and manufactured at Xtrac are for the Motorsport industry. Xtrac’s gearboxes are key components in cars competing in Formula 1, IndyCar, Le Mans (LMP & GT) and World Rally Championship (WRC). As the exclusive supplier of gearboxes to IndyCar, Xtrac has recently been awarded a multiyear extension that continues the brand’s long-time position as the official supplier of transmissions for the Verizon IndyCar Series.